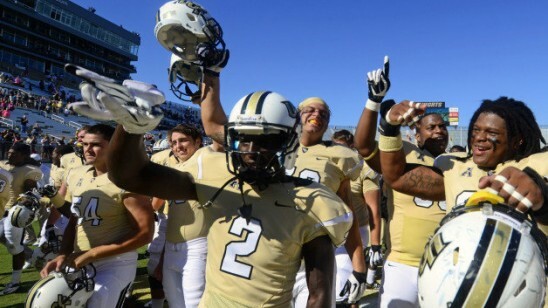 In one of its most impressive conference victories to date, UCF treated fans to a 62-17 victory over UConn Oct. 26, and as a result it received its highest ranking in school history. The Knights placed No. 19 in the Associated Press Top 25 and No. 22 in the USA Today Coaches Poll. The No. 19 ranking surpasses the 2010 team which earned a No. 20 ranking in the final Coaches Poll that year. UCF’s previous high in the AP poll was No. 21 both in 2010 and last week. Overall, the Knights picked up a program-record 464 points in Sunday’s AP Top 25. UCF has been at least receiving votes in all 10 polls since the preseason rankings came out in the summer, a program high. In 2010, the Knights were receiving votes or ranked in the top 25 nine times during the season. The No. 22 spot in the USA Today Coaches Poll marks the second-highest ranking and second-most points in that poll in school history (No. 20 in the final 2010 poll with 328 points). UCF was ranked No. 23 in the first edition of the BCS rankings Oct. 20, which was the highest BCS mark for the Black and Gold.The Knights are now looking ahead to their third and final bye week of the season holding a 6-1 record and a 3-0 mark in the American Athletic Conference. Up next will be a huge tussle with Houston, which also carries a 6-1 overall record and a 3-0 mark in The American. The Cougars battle USF Thursday before traveling to Orlando.